It is Cupcake Day here at the Noshing With The Nolands. I couldn’t resist in joining into this one. Thank you so much Colleen Hill from The Redheaded Baker for hosting this fantastic Cupcake Day. 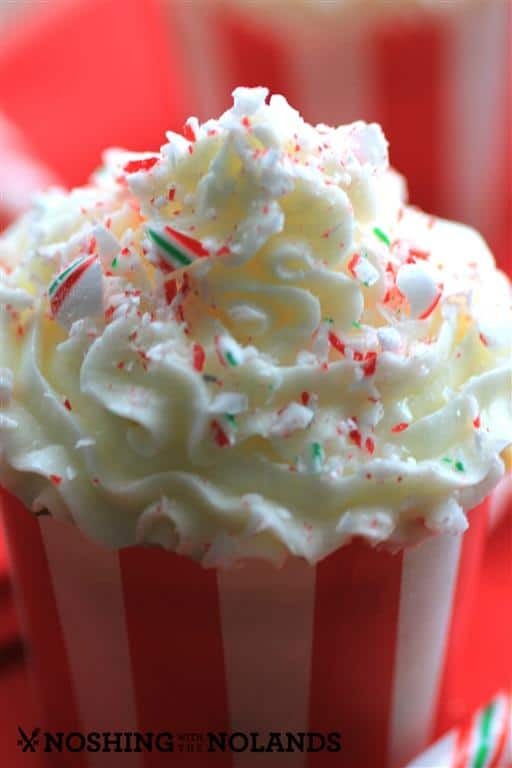 For today I bring you Vanilla Candy Cane Cupcakes. I made these for our daughter’s birthday which was yesterday and they were a huge hit. The kids had them at night and again in the morning. Our daughter doesn’t really like a big cake for her birthday. She really isn’t a huge fan of a big slice of cake but she loves her cupcakes. These birthday cupcakes have also been a big hit. One of her favorites is vanilla with some other sweet and yummy topping. Being close to Christmas I had some candy canes and decided to incorporate the two flavors. I also thought it would be fun to add jimmies (sprinkles) to the batter. 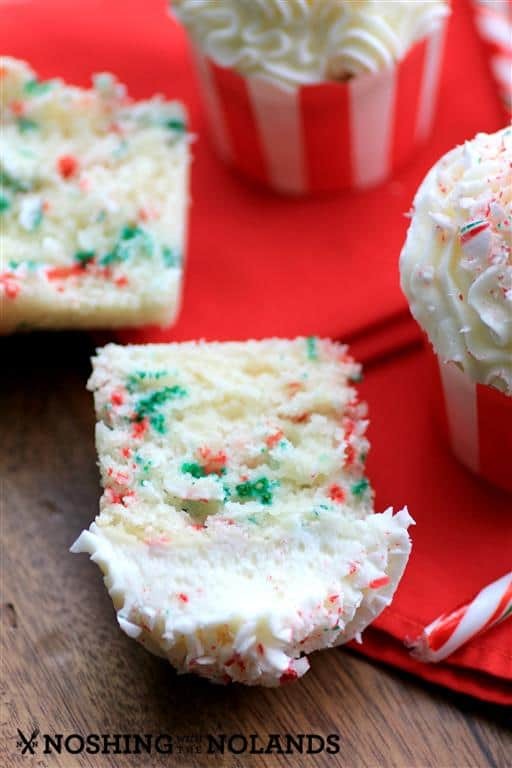 To give the same candy cane colors on the inside but to leave the cupcake vanilla and add the peppermint frosting so it wasn’t overbearing. The combination worked out perfectly. I have to admit I had to have two kicks of the cat for this one though. I had never used these little cupcake holders before. They are adorable but you have to be very careful with them as they stand alone and not in a muffin pan. If they are more than half full they will over flow. I learned that the hard way. So it was round two of the cupcakes for me before I had them right. The first batch was a different recipe and it could have been too runny also. Anyway I went to a tried and tested recipe from my site and changed it up to what you see today. The cupcakes are just the right sweetness, I hate when they are sickeningly sweet. The icing is a buttercream and it is delicious. Easy to make and can be doubled if you like to pile them high with icing or the recipe that I give you works for a nice even layer and that is how Amber likes them, not piled up like you see here. Too each his own!! I would love to share a big bite with you!! Or maybe just lean in for a lick! See how fun the jimmies (sprinkles) are. They add some great color and gee that couldn’t be easier!! Easy and fun to make, I so love cupcakes. 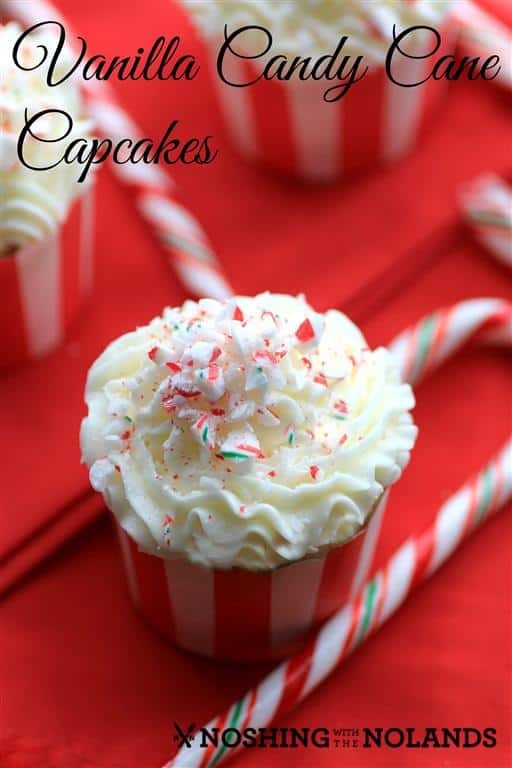 A holiday cupcake filled with the flavors of sweet peppermint. Preheat oven to 350F. Line 24 muffin pans with cupcake liners. Cream butter and sugar together until fluffly. Add the eggs one at a time and then beat in vanilla, sour cream and milk. Mix well. In another bowl whisk the flour, baking powder, soda and salt together. Slowly add the flour into the butter mixture and mix until just incorporated. Fold in the sprinkes. Spoon into cupcake liners ⅔ full (1/2 full if using the upright cupcake holders like I used). Bake for 18-20 min. until they bounce back to a light touch and are lightly golden. Let cool on wire racks completely. For the icing, cream the butter in a large bowl. 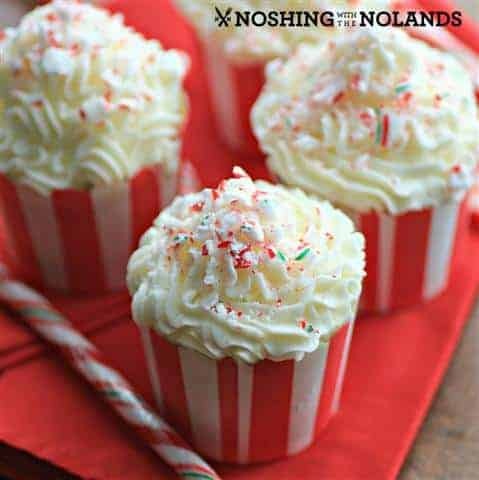 Carefully incorporate the rest of the ingredients alternating the icing sugar with the cream and the peppermint extract and continue beating until light and fluffy. Place icing in a piping bag with a desired tip and decorate as desired. You don’t have to be fancy. Sprinkle with candy canes. Place cupcakes in a covered container until you are ready to eat them. Refrigerate, remove from fridge 30 min. before serving. Enjoy!! Look at all the other amazing cupcakes you can make, I can’t wait to see them all!! YUM!! The cupcakes are beautiful and Happy Birthday to your daughter. I’m making cupcakes for the old folks tomorrow – this is a great idea! Excuse me, I made the recipient last year and everyone LOVED it even at the family reunion. I was asking and wondering about the cupcakes though. I am planning on opening an anime themed cupcake bakery in Idaho or is Washington and I would like in permission to sell such cupcakes every December. I promise you, that i’ll Give credit to you if anyone asked on if I made such cupcakes. Because if you think about it, I will make your recipes famous. So will it be okay if I sell your vanilla candy cane cupcakes when my business became reality and when the time comes? Hi Victoria, sure you can use the recipe and credit me. I wish you luck! Make is famous! Oh thank you! I promise I won’t let you down when the time comes! Love, love your cupcakes and you have put together a terrific cupcake roundup. Thanks, Tara. Soft and delicious looking, just perfect for this holiday season! So festive, and I love that the festive is carried to the inside. what festive cupcakes! that icing looks so fluffy and delicious. 🙂 yum! I don’t know what I did wrong but I left a comment about how much I loved the addition of the sprinkles to the cupcakes and now I can’t find it. So let me just say it again: Beautiful tasty cupcakes, Tara! I love peppermint everything, especially this time of the year! Your cupcakes are beautiful! 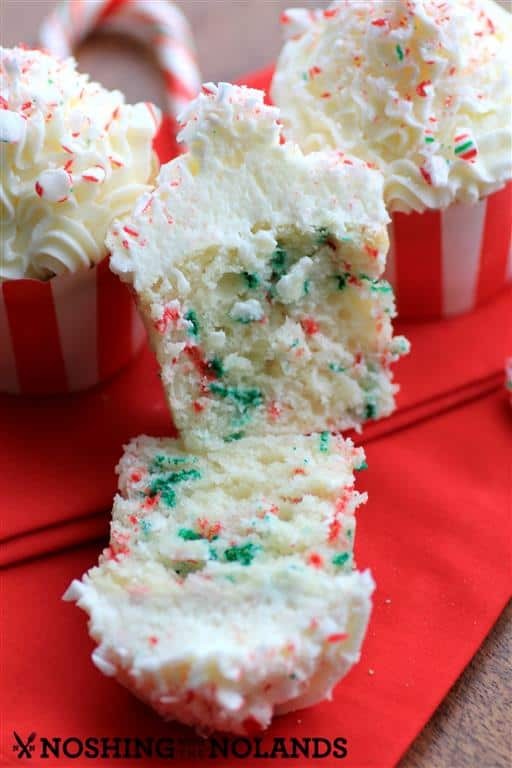 I love how the crushed candy canes look on the white frosting. Delicious! Thank you so much Coleen, and again thank you for hosting! “So pretty!” That was my reaction upon the first photo loading. Great job and very festive. Your cupcakes look perfectly festive for the holidays AND a special daughter’s birthday celebration, Tara. Love that your frosting is piled high and not too sweet…That means I can have more, right? P.s. 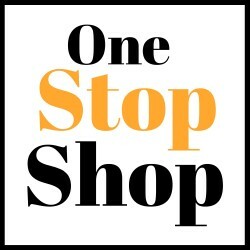 Updated links 3x but your link is still not working…Naturally I wanted to visit you so I simply went to your site URL. ARG, I don’t know why my link still isn’t working. Thanks for making the extra effort. ooooh they’re BEAUTIFUL!! I love the cake texture and that loooovely frosting too! G’day Looks fantastically festive Tara! Lovely idea! Pinned for another time! Tara, these are sooooo pretty! I know that my grandkids would love them! These look so festive. Major yum! These are the most beautiful and festive cupcakes ever! Sorry fold them in at the end, I have made the adjustment in the recipe. Thank you so much Priscilla, so glad you liked them. Merry Christmas!! Good day.I would like to try this recipe but I am a bit confused. One place I saw 1 3/4 cups butter and another place I saw 3 /4 cup. Please clarify for me thanks. The amounts are correct in the actual recipe ingredients. Where did you see 1 3/4 cups butter and I can change it? The total that you need is 1 3/4 for both the cupcakes and the icing. Thanks for responding. I will be using this recipe. Have a bless day. Magic and delicious cupcakes. Good recipe, thank you very much for this.. I used a large star tip for these cupcakes, but play around with different tips before icing to see what you like. So beautiful An looks sooo YUmmYyyy..!! How does it taste with sour cream in a cupcake? It just makes it moister! That recipe is pure genius. Would is be okay if I use such flavor of a cupcake for my cupcake bakery (if I ever make it come true)? Sure, just say where the inspiration came from!! Hi! These look wonderful and I can’t wait to try them. I just wanted to double check before I go to the store. Is it salted butter or unsalted butter? Thank you! Salted or I would specify unsalted. I have to make a note of this to be clearer!